Coral reef managers must make decisions in the absence of perfect knowledge; reefs are highly complex and dynamic systems and future conditions are largely unpredictable. As a result, managers are rarely certain about the precise effects of management decisions. While this can sometimes lead to reluctance to take action, in effect not taking action is also a ‘decision’ – albeit a passive one – that in itself can have important and unpredictable consequences. The challenge of decision-making with incomplete knowledge has given rise to the concept of adaptive management, which includes monitoring as a central component. 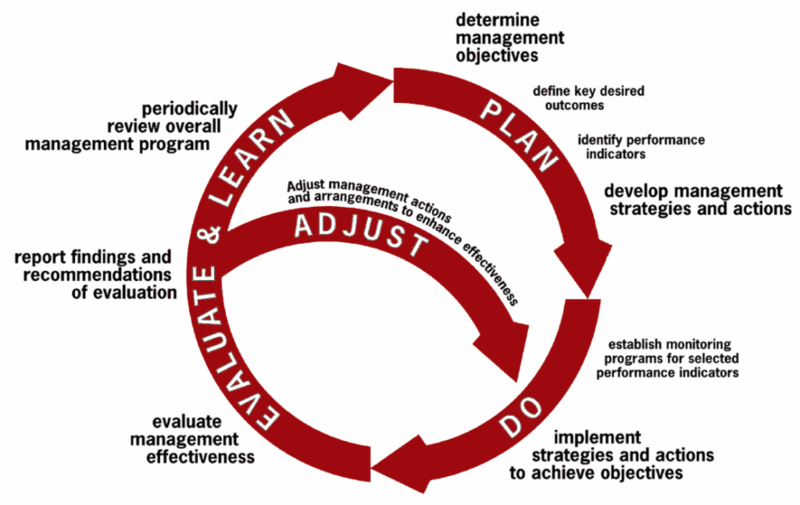 Adaptive Management Cycle, adapted from CSIRO Marine and Atmospheric Research. Adaptive management improves long-term management outcomes, but it is important for managers dealing with urgent problems to find the correct balance between gaining knowledge to improve management in the future and achieving the best short-term outcome based on current knowledge. Managers interested in adopting a structured adaptive management approach will find a number of excellent references, including guides specific for practitioners. ref For an online training program that provides a step-by-step process for adaptive management go to Conservation Training.